Flame Retardant Mesh Food Walls [Set of 4 walls] - California Palms' Mesh Food Walls are perfect for outdoor concession stands. These side walls attach to the canopy top and zip together, providing protection for prepared foods. The mesh side walls allows you to comply with health department regulations while providing a lit and airy environment for your customers to see and smell your food. Mesh food walls are half Flame Retardant fabric and half heavy duty mesh. 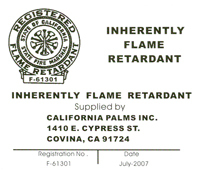 Flame Retardant Fabric - California Fire Marshall certified!